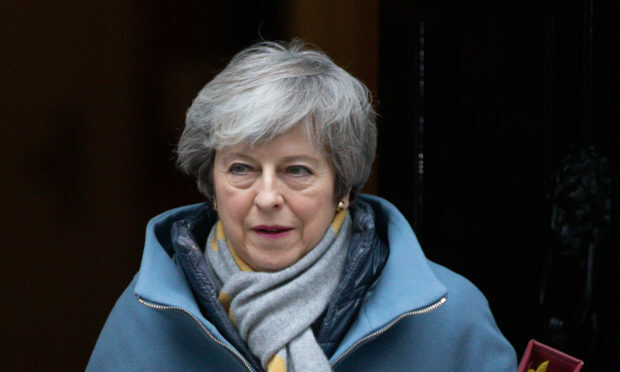 Madam, – The complete and utter shambles Theresa May and her government have made of Brexit absolutely beggars belief. A whole raft of criticisms can be directed at the way Mrs May has conducted herself. They include lack of planning, preparation, understanding of the complications involved and lack of candour with MPs and the electorate. The good lady likes to describe herself as “strong and stable” but I have no doubt that most people will find “weak and vacillating” more appropriate phraseology. Throughout the process she has treated Scotland and its government with withering contempt, ignoring the fact that we overwhelmingly rejected Brexit in the EU referendum and apparently believing we should be grateful for the rock or a hard place choice she is offering us; either a bad deal which is likely to seriously damage the Scottish economy or no deal which may well wreck it. In my opinion Theresa May must rank as the most incompetent prime minister we have had since the second world war and I hope she and her Scottish Tory MPs and MSPs realise there will be a heavy price to pay at the ballot box for the chaos they have created. “Dear sirs, The deal which is referred to as Theresa May’s deal is as much yours as it is hers. It is blindingly obvious that this deal is not acceptable to the UK Parliament and no amount of bullying, cajoling and brinkmanship will ever make it so. The obvious conclusion is that, given the EU’s stated desire to avoid a no-deal Brexit, the EU must now abandon their totally intransigent stance, accept some responsibility and come to the table with some sensible amendments to this deal. Madam, – Britain is still the best place to live; but this will not continue until we confront the major source of our problems: the ongoing ineptitude and venality of too many politicians. Our elected leaders may be called on to make life or death decisions affecting all of us. That requires mature and knowledgeable judgment, which in turn, can only come from people who have relevant training and experience. It takes time to gain such experience. In my opinion, growing numbers of our representatives are unfit for the job because they were elected before they had acquired that relevant experience. Therefore we need to increase the minimum age for entry. I have been saying this for many years; and the most common reaction from my detractors is that some of the politicians I criticise have up to 30 years experience’. That doesn’t mean a thing; all it says is they have gained 30 times one year of nothing more than learning how not to answer a question. Such qualities may be sufficient for salesmen; but it must be right to demand higher standards of competence and ethics from those who aspire to run our country. Madam, – Hundreds of thousands march for a re-run of the Brexit referendum. Who counted them? And how about 17 million voted to leave and stayed at home? Loser always want another throw of the dice and if another referendum is called we will all be the losers. Madam, – In London Nicola Sturgeon tells pro-EU demonstrators that “Scotland [is] the land where more than 60% [who] voted to remain in the EU have been ignored”. And the SNP is the party that ceaselessly ignores the 55% of Scots who voted to remain in the UK. Madam, – It’s not just Brexit that’s delayed. The final Levenmouth Sustainable Transport study (STAG) is now running around six to seven months later than scheduled only last year – it makes ScotRail’s punctuality appear outstanding. Commissioned by Transport Scotland, this key step to demonstrating the case for reopening the mothballed rail link should have been completed by October 2018 according to the published timetable. Questions raised in the Scottish Parliament last week regarding this delay provoked the same robotic and non-informative repetition that Theresa May has perfected. Transport Secretary Michael Matheson committed in September 2018 to come and visit Levenmouth. No sign of his appearance either but that may be due to embarrassment at the long delays for which his department takes primary responsibility. Delaying tactics have been a miserable and confusing failure as far as Brexit is concerned. But will the economic shock of Brexit and its negative impact on public finances be offered as the next plausible excuse not to proceed, however strong a case the study concludes to reconnect the large and struggling community of Levenmouth to the rest of Scotland? Madam, – Mark Ruskell of the Greens wants to put extra expense on already cash-strapped local authorities in order to reduce residential street speed limits to 20mph. There is nothing wrong in trying to save lives and severe injuries by reducing speed limits and encouraging drivers to slow down. The problem is it won’t work because many drivers do not stick to the limits as they now are and, dare I say it, a majority are women, some with signs in their cars warning there is a baby onboard. Rather than spending in this manner, why not use the many Gatso cameras which used to adorn the A90 between Stonehaven and Dunblane, in specific areas of risk, near schools and care homes etc. The risk of penalty points and a fine is surely a more realistic way to make people slow down and save lives. Madam, – I would like to thank and congratulate the Scottish Government on this month paying me the balance of my basic farm subsidy for 2015 and 2016, and look forward sometime to receiving those for the intervening years. It has, yet again, very kindly offered me a loan whilst it works on applications submitted April last year. Such efficiency can only enhance its reputation for the competent handling of complex administration.